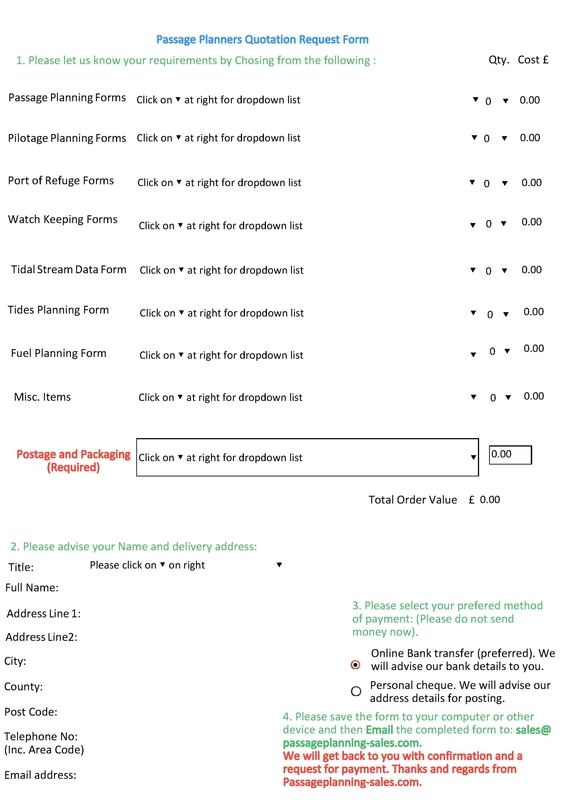 The image on the left shows the form which may be downloaded below which offers an alternative means of ordering and paying for our Passage Planners. 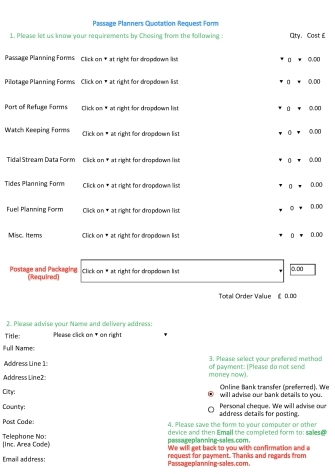 Ordering your Passage Planning forms without going through the PayPal portal. Some customers don't have a PayPal account or indeed do not wish to open an account with PayPal. Or - If you have a problem accessing the PayPal payment portal when attempting to pay for your forms, we have an alternative method of ordering and paying for our passage planning forms. If you do not want to use PayPal you can pay by online banking (preferable) or by personal cheque. Upon receipt of your order we will reply with an invoice which will include our bank details so that you can make an online bank payment, or send us a personal cheque. Please note that, should you prefer to pay by cheque, we will need to clear the cheque prior to dispatch of your forms, so please be patient whilst waiting for bank clearance. IMPORTANT NOTE: The order form, which may be be loaded below, is designed such that it can be filled automatically by you, by clicking the appropriate boxes and by entering details such as your contact details and suchlike, directly to the form. However it needs to be opened by a .pdf reader such as 'Adobe DC' or 'PDFelements' or similar reader which is capable of supporting screen inputs. If you are unable to use the downloaded .pdf in the manner as described above, you may still order by contacting us with your requirements and we will send you an confirmation invoice so that you can make payment. you can contact us on sales@passageplanning-sales.com or via our contact us page.